Have you ever noticed that being a parent offers plenty of opportunities to practice being like Jesus? There are lots of times when what I want to do is not what I am actually doing. Like when I want to be quilting, but I'm getting Nathan ready for bed instead. Or when I want all the boys in bed so I can be off Mom-duty, but the two oldest boys are staying up late so we can play Settlers of Catan after Nathan is tucked in. In Matthew 14:13-14, after John the Baptist was beheaded, we read, "When Jesus heard what had happened, he withdrew by boat privately to a solitary place. Hearing of this, the crowds followed him on foot from the towns. When Jesus landed and saw a large crowd, he had compassion on them and healed their sick." Jesus wanted to get away. His cousin had just been murdered, which must have horrified and saddened Him deeply. He wanted to get away from everyone and grieve in peace. As a mom, I can relate, on a much smaller scale, to that feeling of wanting to be left alone. Of wanting to tend to my own needs, my own thoughts and my own feelings for a while. But before Jesus could even get the boat to His destination, the crowd had already started to gather. Did His heart sink as He stared at all the people waiting for Him? They were all needing and expecting something from Him. Did He wish they would just go away for a while? I have certainly felt that way at times, and the demands on me are much lighter. But He had compassion on them. He put aside His own needs and healed their sick. I imagine that meant listening to each person describe their problem (and you know how people can drone on about their sicknesses! ), then healing them before moving on to the next person. I also imagine each person felt truly heard, as if they had His undivided attention for as long as they needed, even with the huge crowd that surrounded them. And make no mistake, it was a huge crowd. This was the same day Jesus fed five thousand men, plus women and children, with the lunch donated by one little boy. Jesus put aside His own needs for the needs of others. As a mom, I get plenty of chances to do the same thing, to make my own character match that of Jesus. He came to serve others and He expects me, as His follower, to do the same. Unfortunately, I often get it wrong. I get frustrated with Nathan when I'm reading and he brings me a book to read to him. Or I tell Zach we'll play a game some other time, secretly hoping he'll forget all about it. Even when I do agree to do whatever it is they're asking, there are times I'm whining in my head, wishing I could just get back to what I want to be doing. Thank God I know "that he who began a good work in you [and me] will carry it on to completion until the day of Christ Jesus" (Philippians 1:6). So there will be more and more opportunities to improve my character until I get it perfectly right every time. And we all know when that will be, right? 'The day of Jesus Christ.' In other words, not until Jesus comes again. But God won't give up on me. He won't decide I'm a hopeless case, throw up His hands in despair and move on to more promising prospects. He has compassion on me too, forgiving me when I confess my selfish attitude and lovingly providing me with more chances to try to get it right. What about you? 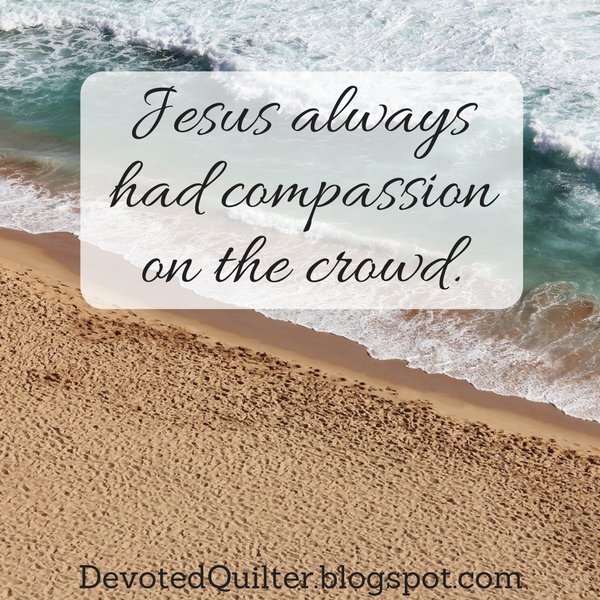 Do you identify with Jesus' desire to escape the crowd? Do you struggle with setting aside your own needs for those of others? Do you find comfort and hope in knowing He had compassion on the crowd that day, and in knowing He still has compassion on us today? I certainly do. Just wanted to tell you that I enjoyed your devotion today! Thank you for sharing. Have a great day.